The Helmeted guineafowl (Numida meleagris Linnaeus, 1758) belongs to the order of the Galliforms (Galliformes) and is the only species of the genus Numida. 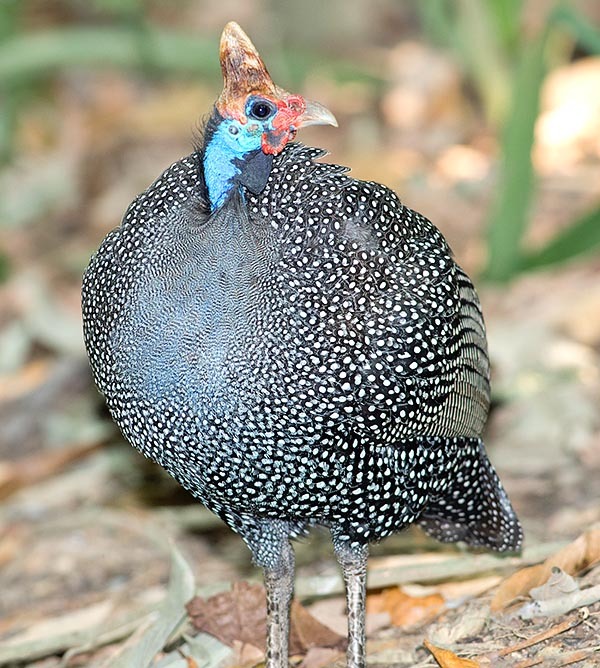 It stands by sure amongst the most known birds, also because it has originated the domestic forms bred all over the world, belonging to the family of the Numidids (Numididae), grouping species known under the generic term of “guineafowls”. There are usually 9 subspecies recognized with more than 30 different forms: Numida meleagris meleagris Linnaeus, 1758 from eastern Chad to eastern Ethiopia, Zaire, Uganda and northern Kenya; Numida meleagris mitrata Pallas, 1767 in Tanzania, Mozambique, westward through Zambia and Zimbabwe to southern Angola and northern Botswana, islands of Zanzibar and Tumbatu; Numida meleagris galeata Pallas, 1767 in south-eastern Chad, central-southern Zaire and northern Angola; Numida meleagris coronata Gurney, 1868 in eastern South Africa; Numida meleagris marungensis Schalow, 1884 in some zones of the Congo Basin, Angola, Zambezi and Zambia; Numida meleagris reichenowi Olgivie-Grant, 1894, in Kenya and central Tanzania; Numida meleagris somaliensis Neumann, 1899 in north-eastern Ethiopia and in Somalia; Numida meleagris damarensis Roberts, 1917 from southern Angola to Botswana and Namibia; Numida meleagris sabyi Hartert, 1919 in north-western Morocco. The name of the genus “numida” comes from the Latin and refers to the old population of the Numidians, the inhabitants of Numidia, region of north-western Africa, therefore the name of the genus refers to land of origin of the species. The term indicating the species “meleagris” comes from the Latin and is the name that, after Pliny the Elder’s writings, the Romans were rightly giving to the guineafowl. The same name has been assigned also the well known Wild turkey (Meleagris gallopavo) with which, initially, the fowl was mistaken, as both coming from far away lands, not well specified, but actually very different. The helmeted guineafowl, as all the so-called guineafowls, is native to the African continent. It is distributed, with the various subspecies and forms in most of sub-Saharan Africa and with one subspecies (sabyi, which however is probably extinct!) north to the desert of Sahara, in Morocco, between the river Oum Er Rbia (central Morocco) and the river Sebou (northern Morocco). The helmeted guineafowl has been introduced on the Cape Verde Islands, in some zones of Arabia, in Madagascar, in some zones of India. Some grown wild domestic forms are present in America and in other countries being the forms selected for breeding much diffused. The helmeted guineafowls live in an ample variety of habitats: from the borders of the forests to the savannahs even wooded, in the scrub forests, in the steppes, in the sub-desert locations and in the open countries, in the shrublands with spiny bushes, particularly common in the savannahs alternated with cultivated areas. The local distribution of the species is linked to the availability of water for the watering and to the availability of suitable sites where perching (usually trees and bushes). In its own range, the guineafowl is present from the sea level up to mire than 3000 m of altitude. Often huge flocks are observed close to the water ponds. Flocks of guineafowls have adapted to live, getting urbanized, in Cape Town, South Africa. It has squat body with dorsal profile rather curved-humped (typical of the guineafowl), head (and first portion of the neck) mostly featherless, rather small, with typical corneous “helmet” placed on the vertex of the head, short and rounded wings, short tail kept under the body. It is about 53-63 cm long, with an average weight of about 1150-1600 g. The bare skin of the head-neck is blue or bluish white with possible red zones. The “helmet-like” bony protuberance is very characteristic and identificatory of the genus and of the species; the head shows also some facial appendices (wattles) mainly of red colour and black thread-feathers arranged even in opposite direction with respect to the normal feathers and mostly placed at the level of the nape-upper neck. The colour of the livery is mostly slate grey-blackish with white dotted spots very regular and well distributed on the whole livery (tail included), there can be also some thin white-whitish vermiculations. The neck and the chest can have, in some subspecies, lilac hues. Brownish remiges and outer barbs streaked with white. The females are similar to the males but are usually smaller and with wattles and helmets slightly smaller. The young have opaque dark brown livery with cream-reddish parts, smaller wattles and helmets and presence of down covering also the head up to the achievement of the sub-adult age. The various subspecies distinguish mainly for the different conformations of the appendices of the head and of the neck; for the quantity, disposition and extension of the thread-feathers of the neck and the head, for the shape and colour of the cere and for the possible presence of thread-feathers-bristles at level of the base of the beak; for the size, shape and colour of the wattles; for the shape and size of the corneous helmet; for the colour of the neck-chest. The eyes are more or less dark brown. The paws, strong and equipped with strong claws but without spur, are slate grey-dark-black. The helmet is horn brown with base and vertex of the head which may be red; the corneous helmet has bony base and dry and slightly cracked look. The beak, rather stocky and sturdy, is brown-horn grey with base that can be reddish, tip which may be yellowish and cere possibly coloured. This species has sedentary habits and the local movements it does seem to be strictly influenced and dependant from the presence, or absence, of water sources and of suitable sites where perching especially during the night. The guineafowls move walking and running, covering even several kilometres per day, flying only if obliged doing a flight almost vertical “like a pheasant for hunting”. It forms huge flocks out of the reproductive season. 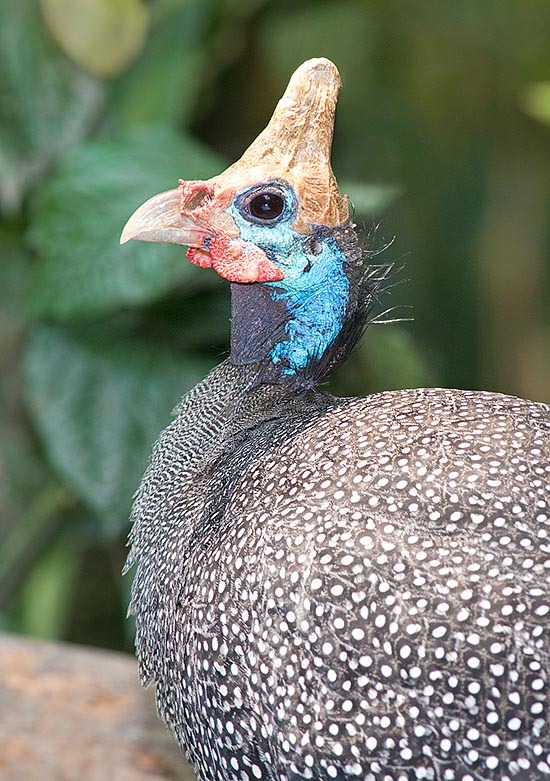 The guineafowls emit very strong and noisy vocalizations, almost deafening. The helmeted guineafowl is omnivorous though the aliments of vegetal origin prevail, in the specific: seeds, tubers, bulbs, roots, berries, flowers and leaves. As they nourish also in the cultivated fields, they are not always looked at with “a good eye” by the countrymen. The aliments of animal origin, generally invertebrates, form as an average only the 12% about of the total food but they are preferred when available. 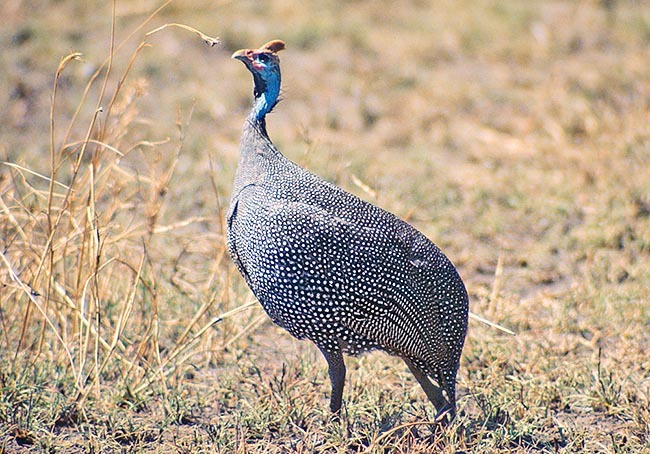 The guineafowls catch mainly insects, in particular grasshoppers, locusts and termites, but also snails, ticks, millipedes, lizards, frogs, various small animals, etc. These galliforms nourish usually on the ground, scratching with their strong paws or ripping off the seeds directly from the spikes, panicles, etc. of the grasses. The ticks can be detached directly from the body of their hosting Desert warthogs (Phacochoerus aethiopicus); the attitude to find and hunt ticks might be exploited utilizing these birds for the containment of these arthropods carriers of serious diseases. The helmeted guineafowls reproduce in almost all the periods of the year or mmediately after the season of the rains; mostly in November-January in South Africa, prevailingly in May-July in Western Africa, in March-May the population of Morocco. The species is monogamous but the pair bonds are not maintained outside the reproductive season; in any case at the beginning of such time the males may try to mate even more females. The males can be quarrelsome among themselves, bickering with raised wings and open beak. The nest is a simple hole dug in the ground and covered with some grass and some feathers. The nest is usually done in the long grass; hidden under a tussock, in the cultivated fields or in the thick of the vegetation. The clutch is usually formed by 6-13 (up to 20) eggs; nests with many eggs (20-50) are the fruit of more females spawning in the same nest. The eggs have colourations going from the yellowish to the pinkish to the pale brown up to almost the white. The average size of the egg is of 44-58 x 36-42 mm. The brooding, which begins when the spawning is completed, lasts about 27 (26-28) days and is done by the females whilst the males keep the watch. The eggs of guineafowl have thick shell and during the hatch, the first pecks of the offspring (tweet), deteriorate the shell creating rather extended cracks (seen the rigidity of the shell); the newborns hatch without “opening” a real and proper operculum on the obtuse side (as many birds do) but rather “demolishing” this part. The chicks have cinnamon-leather-reddish-brown colouration with various dark stripes and paler ventral parts, beak and paws orange, thus resulting rather mimetic. The chicks are able to perform short flights when about 1 week old; the young are able to fly away when 1 month old though grouping in more numerous flock when 1-3 months old. The survival rate of the young is quite low. Although the species does not appear particularly menaced at global level, excepting the subspecies of Morocco which results in danger if not already extinct, it can be severely hit by the hunting and the collecting of the eggs. Another serious danger for his bird is the habitat degradation and the massive use of pesticides. 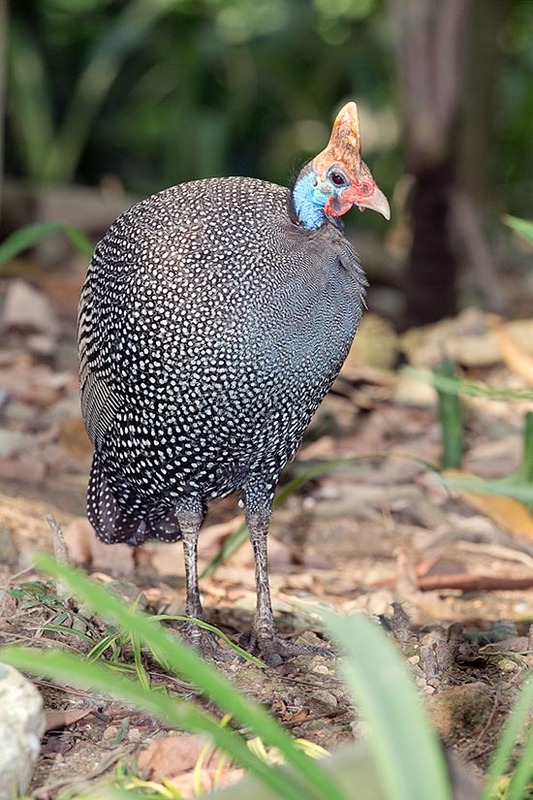 The guineafowls were introduced, as animal for breeding, in Europe since the old times; later on they diffused all over the world thanks to their delicious meat. The domestic forms, that usually have the paws dappled with yellow, have been selected in many varieties of non natural colours: dappled with white, pale grey (light blue), beige isabella (chamois), uniform light blue violaceous (lilac), dark grey with almost absent spots, etc. Even if the selection has mainly acted on the colouration and in lesser extent on the size and the behaviour, the guineafowl has not undergone the major upheavals in size and shape characterizing other domestic animals. Though the domestic forms of guineafowl are much bred, on the contrary, unluckily, this is not the case of the very interesting and wonderful wild forms. The wild subspecies of helmeted guineafowl should be, obviously pure, more bred and propagated amongst the amateurish breeders as well as n the zoological gardens. The maximum outlook of life of this species is of about 10-12 years in the wild, more when in captivity.